The folks at the Georgia Robotics and InTelligent Systems (Grits) Lab at Georgia Tech have been hard at work for some time now researching swarm robots. A portion of said work deals with tasks that require a group of hi-tech gadgets to individually reach a location and a specific time — much like the mobile landing platform that we saw last year. 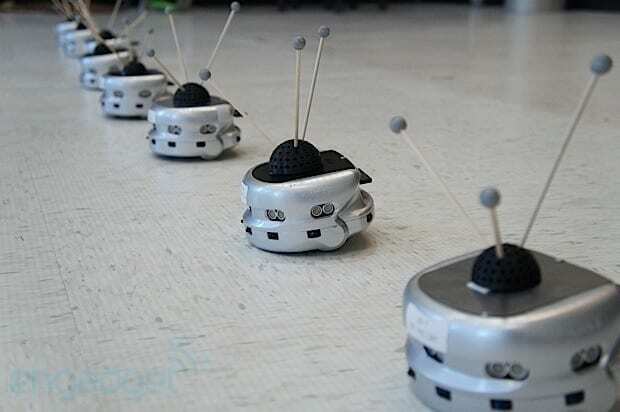 The group is given a “score” and must determine how many of the Khepera robots are needed to meet the goal, assigning specific roles and determining the shortest route to hitting their targets. One particular demo that we saw involved the swarm bots playing a projected piano of sorts to perform a short snippet of Beethoven’s “Fur Elise” — internal cameras, special “hats” and cameras mounted around the room lend a hand in carrying out the assigned duties. Musical performance is just one of the projects underway in the GritsLab. A real-world scenario involves the use of swarm robots for convoy cover. Using Parrot AR.Drones alongside the diminutive machines that we saw in action, researchers are looking at ways in which UAVs can be deployed to investigate and eliminate threats to convoys on the ground.